Did you know there are about 7,000 spoken languages in the world? In the Americas alone, over 1,000 languages are spoken by indigenous groups. For the staff at Radio Indígena, the variety of languages is both a reason for being and a cause to advocate. The speaking of native languages is a critical part of cultural identity and well-being for indigenous communities, and it’s critical to the well-being of immigrant workers and their families who arrive in the US without speaking either English or Spanish. Josefino Alvarado, a California farm worker, said that many in his community were not kept abreast of current events before Radio Indígena because no news source was available that they could understand. Only a handful of indigenous radio stations exist in the US. Many immigrants come to the US from Oaxaca—so many that a school district in California had to ban the term “Oaxaquita,” or “little Oaxacan,” as offensive. (According to census data from 2010, about 685,000 Latinx people in the US identify as indigenous.) People from Oaxaca frequently speak Mixteca, which has linguistic roots dating back 10,000 years and has over 50 dialects. Immigration contributes significantly to the loss of indigenous languages—or rather, the cultural isolation and discrimination that immigrants often face does so. Parents who emigrate to the US don’t always land in a place where others speak their language, and children are encouraged to learn English or Spanish to facilitate communication. Without a community of people who speak it, preserving a language is next to impossible; written resources on the Internet are scarce or unavailable for the vast majority. Wikipedia, for example, has active pages in less than 300 languages. There are English and Spanish pages about Mixteca, but no page written in the language, even though Mixtecs are the third-largest group of native Mexicans. In part because of this paucity of resources, MICOP and Radio Indígena do more than just provide radio in various languages. 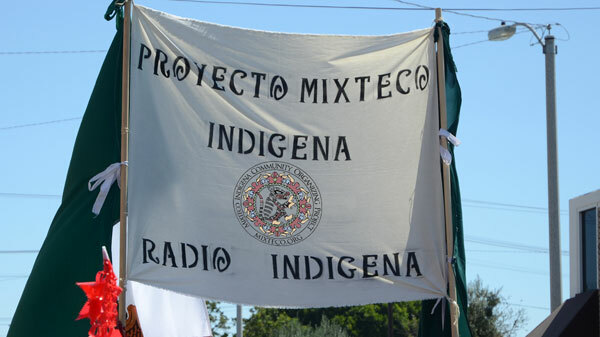 MICOP provides medical and mental health services, education and literacy programming for kids, direct assistance to indigent community members, and cultural competency training for others wishing to engage the indigenous community—in addition to what it refers to as “community empowerment,” which includes Radio Indígena. They do all this with a budget of less than $2 million and only one full-time executive staff member. Eighty percent of MICOP’s staff is indigenous, as is forty percent of their board. Organizations like MICOP, Radio Indígena, Indigenous Rights Radio, and other Latinx indigenous resources may be increasingly necessary as the demographics of immigrant populations shift. (North American indigenous communities, of course, have their own language preservation efforts and media organizations.) The New York Times noted that immigrants speaking only indigenous languages face increasingly long waits at the border because, though immigration officials provide interpreters in 350 languages, they’re missing or sparse in languages like Mam, K’iche’ and Q’anjob’al (all indigenous to Guatemala) and people arrive unable to communicate with immigration officials, advocates, or lawyers. DTL! Comunicacion Popular in Argentina responded to corporate media control by building infrastructure that allows hundreds of communities in Argentina to tell their own stories.